I think we can work around this by separating the image's color channels and the additional "channels" with a divider. If it's also only available in RGB, nobody will get their CMYK-separations affected. A color space conversion is then only performed if you use curves on the special channels (and it's only available in RGB, so it won't matter). Besides, nobody expects a luminosity-adjustment to only affect a single channel in a color image. There are a bunch of software out there (especially for video editing) that lets you adjust things like saturation curves already. 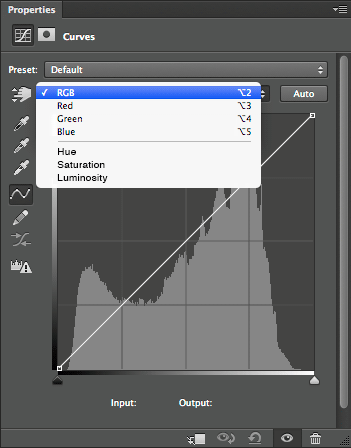 My suggestion is channels for Hue, Saturation and Luminosity (using the usual Photoshop recipie). Lab could perhaps be added as well (if nothing else just to get people to stop converting to Lab for no reason). I know for sure that Saturation curves would cut down the number of Adjustment layers in most of my files (a good thing for sure in 8-bit documents). If the Photoshop team still thinks this would be confusing (to who? how?) then please add it as a new type of adjustment layer instead. Saturation curves would be the bee's knees. Actually... 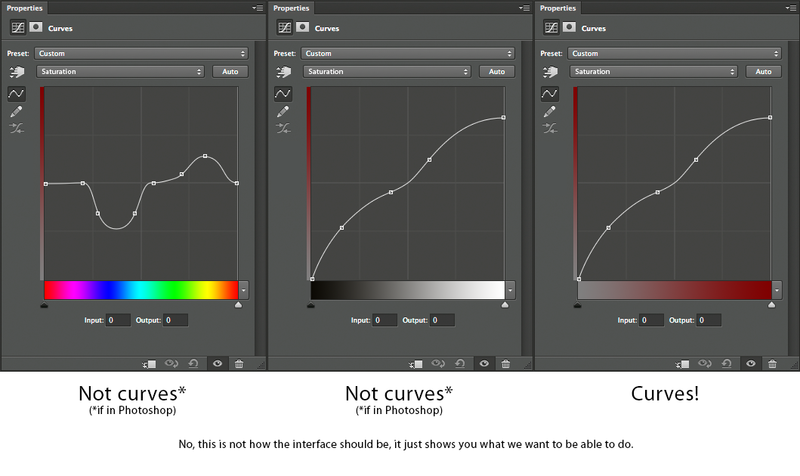 If you are to leave Curves alone, you could completely overhaul "Hue/Saturation" instead as HSL-curves would cover the same functionality (but with a larger level of detail, and be more efficient for professionals). Perhaps an option to click "Advanced" to roll out the curves-view if you are worried that it will confuse novice users. Your suggestion doesn't change the destructive result at all. It might be better if you described what you were trying to accomplish instead of your imagined solution. I'm just trying to adjust components like HSL using curves (an interface like "Curves", but doesn't have to be part of the Curves Adjustments we have today). That's what other people here want as well I believe. I do a lot of retouching and this level of control over e.g. saturation would be worth its weight in gold. The more I think about it, the more details that have to be adressed show up... If "amount/value" is on the Y axis, should we have hue, saturation or lightness on the X axis? All are useful in different scenarios, so perhaps a way to switch between the modes?. Hmm... Today in the Curves adjustment interface there is no room for this, so I think it would be best with a new adjustment altogether (or a replacement of hue/saturation as everything you can currently do with hue/saturation today would be covered by a new tool like this). Perhaps call it "grading"
Back up a step and describe what you are trying to accomplish, not the method you imagine might enable it. Don't mock it up, just describe what you are trying to do that you cannot easily do today. "I'm just trying to adjust components like HSL using curves". Sorry for "mocking it up" by trying to go into a little detail afterwards and thinking out loud regarding the use/detailed features of such an adjustment. I guess you don't want people doing that? I want to adjust the saturation of my image depending on the current brightness, saturation or hue. For example add saturation to shadows, lower saturation in areas with high saturation while keeping the rest unchanged or to change the saturation for different hues (e.g. desaturate everything but some red tones). Yes, the last example can be achieved today with the more cumbersome hue/saturation interface. With "Saturation" as an example using the current Curves interface as a starting point, you would have the saturation amount on the Y axis, and on the X axis you would have Hue, Saturation or Lightness. Replace "Saturation" with Hue,Luminosity, a and b, and I believe we have covered all the requests in this thread. Personally I think HSL would be enough. Combined with layer masks this would be a powerful and creative adjustment layer. Let's say I want to vary the amount of saturation based on the current lightness/luminosity of a pixel (perhaps I'm working on some troublesome skin highlights or want to desaturate some shadows). I would have to use a Vibrance or Hue/saturation Adjustment Layer and a luminosity mask (loaded from the RGB channel, but first turning off visibility of any layers above the adjustment). Not too much hassle so far, but already we're wasting time. Then I have to change the saturation amount to the level I think will be good. Then I have to perform a destructive curves-adjustments directly to the mask to change how much the different ranges are affected. Any changes to the below layers (e.g. some healing) will require me to recreate the mask from scratch. I am also lacking a good preview as I cannot change saturation and the affected ranges at the same time, forcing me to go back and forth a bit (but due to the destructive nature of the mask adjustment you have to get it fairly right on the first try). There's a reason why people never suggest doing this with todays tools. Analogy: You have a screw, and tell me you want a hammer. It would be better for you to describe the screw so I can provide you with a better solution (a screwdriver). Trying to mock up your imagined solution still focuses too much on the imagined solution and not enough on defining the problem to be solved. > I want to adjust the saturation of my image depending on the current brightness, saturation or hue. That's a good start. But curves could only help with saturation -> saturation mappings. You are really asking for something quite different from curves and the original request above. The references to other apps helps define what you're actually after, and now I think I understand what you're asking for. You are focusing too much on semantics here. To me it feels like you don't understand what I mean because I say I want a screwdriver for my screw – because you secretly refer to it as a turnscrew even if "screwdriver" is the common name. “a method of mapping one value to (the same) or another using a 2D grid with one value on each axis and using points to define a spline* (*not curveTM) to show how one is mapped to the other”. Is that better? I have no name for it. Call it spline or Bent-line-adjustment if you want. Me and everyone else will still call it a type of curve adjustment. Ok, sorry for venting. Had to get it out of my system. I guess you understand what we want to be able to do now, and if you have used Curves a lot I'm confident you would understand why a curve-like interface would be efficient for such adjustments.